Built in 1992, we designed Moss Cottage to cater for the needs of visitors wanting to stay in our beautiful crofting environment with every they require to enjoy a peaceful and comfortable stay, and in 2016 we opened Roangorm to the same high standards. Both are a 2 min walk from Badenscallie beach where you will find lots of rockpools, sandy coves, birdlife flora and fauna. A perfect place to paint a picture too! The surrounding area also offers excellent walking and canoeing. Excellent area for your mountain bikes or gentle cycles. Moss cottage sleeps 4 people (plus cot if required) Roangorm sleeps 6, both are spacious, welcoming and warm. A beautiful location offering views and nature on your doorstep, and easy access to the wonderful land, coast and scenery all around. 2 bedrooms, Living room, kitchen, Bath/shower room, electric heating. We have off road parking with space for 2 cars and a fenced garden with stunning views. 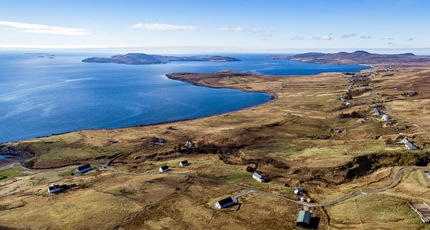 Minutes from the beach and with views out to see and over the stunning Summer Isles. 4 bedrooms, Living room, kitchen, Bathroom + shower room, oil heating + wood burner (1st bag logs free then �10 bag from owners). Minutes from the beach and with views out to see and over the stunning Summer Isles. Sorry, no pets. Both properties designed to offer our guests comfortable accommodation in our lovely part of the world. Two modern and tastefully furnished properties. Electric heating in Moss Cottage, Oil Heating and wood burner in Roangorm and fitted wardrobes in both rooms. All duvets, pillows and bed linen are included in your rental price. Towels are also included, though you are welcome to bring your own. The linen is of a high standard, as are the towels. We are within 2 miles of shops, petrol and the award winning Summer Isles Hotel and bar. Guests who prefer a relaxed holiday will discover a unique tranquillity and peace in this rugged paradise. Badenscallie Holiday Cottages are situated in the crofting township of Badenscallie. Lambing time is always interesting (April/May). Come later in the year and you can watch the men clipping the sheep in our big shed. Enjoy stunning views from your windows of mountains and sea. Below us are the Summer Isles, including Horse Island and Goat Island. Behind us Beinn Mor Coigach rises to 2,437 ft.
Coigach is a wonderful part of the north west Highlands of Scotland. Famed for the unspoilt environment and nature, the Highlands offer visitors a chance to experience nature and the land as it is meant to be. The surrounding crofting community retains a charm that is hard to find elsewhere. The history and culture of the region is ever present, along with an environment that is famous throughout the world. Walk, cycle, climb, explore - we have beaches, coastline, hills and glens all around! Our first time in this part of the world but we are sure it won't be the last. The Highlands lived up to our hopes and the cottage at Badenscallie provided us with a great location. We enjoyed the beach and coastal walks on the sunnier days but found the drive along the lonely roads atmospheric and beautiful even when less sunny. Thanks for everything, great place, great host, will return.